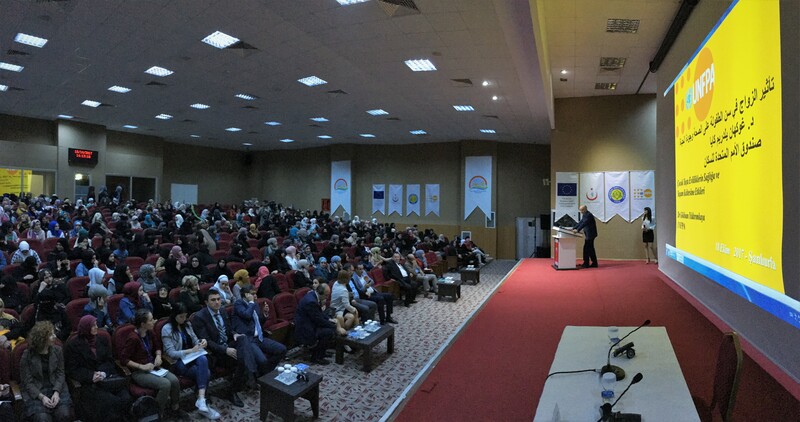 October 18th, 2017, Şanlıurfa - "Child Marriage Awareness Panel " was organized in Şanlıurfa by United Nations Population Fund (UNFPA), funded by European Civil Protection and Humanitarian Aid Operations (ECHO) and with the cooperation of Ministry of Health and the implementing partner Harran University. During the panel in which more than 450 refugee women participated, Dr. Gökhan Yıldırımkaya - Reproductive Health Program Director of United Nations Population Fund (UNFPA), made presentation about Physical, Psychological and Social Dimensions of Childhood Marriages; Gender Specialist from Denmark Refugee Council, Attorney Melike Çilingir presented the issue of Legal Status and Obligations in Early Age Marriages in Turkey? and Nesrin Semiz from Başkent Women Platform Association made presentation about Child Marriages from the Islamic Perspective. In opening speech of the panel Public Health Directorate, Chief of Migrant Health Department, Dr. Kanuni Keklik stated that "Child marriages are a very important issue that adversely affects our future. For strong future generations it is a must to include all women in the studies. Please put the information you will learn here today into practice and share them with your circle. Child marriage is a problem for all of us; we all should be sensitive on this subject. High number of participation in this panel today reveals how much importance you give to this issue. Marriage is a holy concept. Let's protect this holy concept and our girls". Karl Kulessa, United Nations Population Fund (UNFPA) Representative to Turkey stated in the opening speech that "Child marriage is a global problem. One out of nine girls is forced to get married before they are 15. Most of these girls, who are forced to marry, are from rural areas with low income and education level. It is assumed that 70 million girls will be forced to get married in five years meaning that everyday thousands of girls are being forced to marry. Many families think that they contribute in the household by making their girls get married. However, such marriages end up negatively both for the girls and their families". United Nations Population Fund (UNFPA) Reproductive Health Program Coordinator Dr. Gökhan Yıldırımkaya said in his presentation that “All around the world, people are working to empower girls. So we should also cooperate for the future of our girls and should set to work from today for their health. All under the age of 18 are considered as children. As a fact of their nature children are expected to grow; how can a child who have not completed his/her growth can take care another one? Children generally do not decide to get married themselves; their parents/elders take this decision on their behalf and make them "get married". Children experience many changes during their early ages. These ages include many problems of compliance when psychological imbalance is encountered. Forcing children who already struggles with many problems to get married with the idea of "let us make him/her get married then he/she will get better" may worsen their status. There is an obvious definition that the truth is childhood marriages steel the future of those children". Gender Specialist from Denmark Refugee Council, Attorney Melike Çilingir stated that "There are Psychological and Social Dimensions of Forced Childhood Marriage. Individuals who suffered from traumas like war and who were forced to immigrate undertake heavy responsibilities that they barely can handle. They force girls to get married with the expectation to take the load off their shoulders, to protect girls and for economic savings. Actually, every marriage made during childhood is deemed as a forced marriage, because a child cannot take such a decision with his/her free will in such early ages. Attorney Çilingir also informed the participants that besides the crime of child marriage, the witnesses of such marriages are also obliged to report to the authorities”. Attorney Çilinger gave information to the participants about an important detail on this issue: "Please remind that many rights provided by laws are waived due when a child marriage occurs". Nesrin Semiz from Başkent Women Platform Association stated in her presentation titled as Child Marriages from the Islamic Perspective that "When we look at the Islamic point of view, we see that Islam religion says 'not to do that'. In our religion the approach is that women should live an honorable. Human life is very important in our religion. The most important element that comes after belief is human life. Another issue is protecting the generations. The condition for a healthy society depends on the well-being of its individuals. We know that childhood marriage destroys psychical and psychological well-being of girls, putting the health of that individual and future generations at risk. Child marriage treats negatively to both issues in which Islam gives paramount importance. Keystones of healthy society are surely damaged by childhood marriages. Do not cast a shadow on the lives of your children with the marriages made before the marriage age". Two Syrian refugee participants took the stage to share their own experiences. One Syrian woman participant who was married when she was 15 stated that she undertook the liability to look after her babies when she was a child, herself and this responsibility which requires a great effort made her sink into depression. The participant stated that she had to quit the school and she highlighted that she still envies her friends who became teachers, doctors, engineers and said that "Don't be part of this crime and don't cast a shadow on the dreams of your girls". Another refugee who took the stage stated that girls try to shoulder extremely heavy load due to the increasing responsibilities stem from the marriage they got into. The participant, who had three children before she reached her 18th birthday, shared that she was very depressed due to loneliness and social pressure. The participant who stated that her husband was not able to support her who was also in his child himself too. Young girls do not deserve to wrestle with such complicated problems. We should protect our girls against these types life-threatening problems caused by childhood marriage.